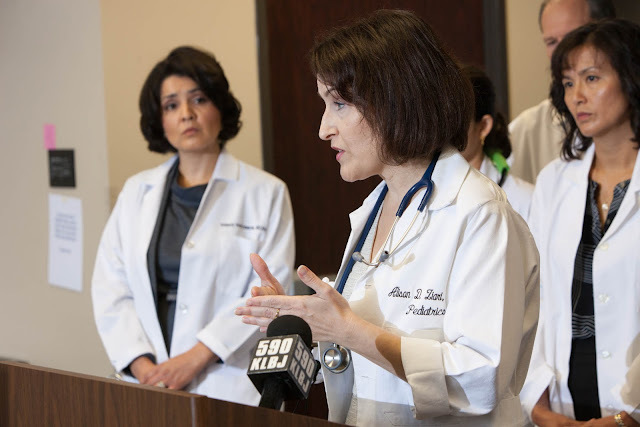 Austin Regional Clinic (ARC) announced today its physicians no longer will accept new pediatric patients whose parents opt not to have them vaccinated. The clinic will continue to care for children who cannot be vaccinated for medical reasons — their weakened immune systems make them unable to receive vaccinations, or they have adverse reactions to vaccines. ARC adopted the new policy to protect all of its patients from disease, in light of the measles outbreak in California’s Disneyland. In that case one infected individual spread measles to more than 115 people in at least 21 states. ARC aims to protect patients with weakened immune systems or who cannot be vaccinated from accidental exposure. The decision is part of a small but growing trend among clinics and pediatricians who take seriously their responsibility to protect all of their patients from vaccine-preventable diseases. ARC also ultimately will discharge current unvaccinated patients whose parents are unwilling to begin a vaccination catch-up schedule. Keller pediatrician Jason V. Terk, MD, president of the Texas Pediatric Society, similarly discharged unvaccinated patients from his own practice in Keller. He wrote that accepting unvaccinated children in a practice can risk the health of other patients, especially in a waiting room environment. Yes, this is a good decision. Now that outbreaks have reminded people what it was like to deal with these terrible diseases before vaccines, hopefully more rationality like this decision will make its way back into the public mindset and encourage more vaccination for those who can be vaccinated safely.